I had a great lesson with Cheryl on Sun. It started with her longing me on Rogo. 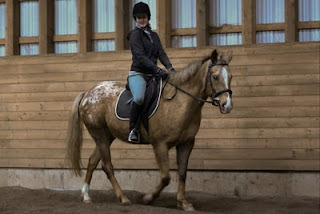 We worked on my exercises, particularly to relax / loosen my hips at the beginning while he walked. 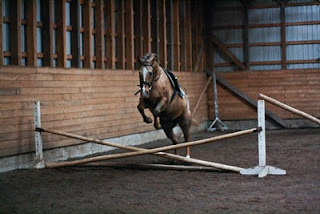 Then we worked on getting a good working trot, (no stirrups - yikes!) which we did fairly quickly. Then she wanted me to hold a better position in my canter. Well to be clear, I wanted to as well, but am stuck quite often in still thinking I have to PUSH him in the canter and my heels tend to come up. He's carrying his canter quite well most of the time and I don't want to teach him to only respond to a heavy aid, but it's hard to build new muscle memory. Anyway, after a few tries, knowing she was keeping his canter I got my position corrected and maintained it into the trot transition (another challenge, my foot goes forward). Then we took the longe line off and worked on cantering across the diagonal and changing leads. He's done this outside for awhile, but the indoor is smallish and he hasn't done it in there. I learned from one of the clinic videos I watched that with a young horse you may succeed with canter steering by asking several strides before you need the movement because it takes them some time to process the ask. I tried this and it worked first try! He cantered across the diagonal, trotted, picked up the opposite lead and continued on. We did it twice, but I was too tired to do any more. It amazes me how much energy is needed to ride him, even when he's forward and well behaved as he was yesterday. How will I ever hold it together through an entire test? They are deceptively tiring, I know from showing Savanah, and Rogo's bigger movement makes him more taxing to ride, although I LOVE it. We did some leg yield practice (still a challenge) and some halts. For the second ride in a row he did these square ramener (beginning of collection) type halts. It might be a fluke, but I think a good halt is coming. He gets off track so easily though - I have to completely take my legs off the second the halt happens, or he thinks some kind of turning should be required. I want to clarify something from my previous post '2010's Top 10'. I mentioned I'd been competition manager for a dressage show. I was, but it was my first time as a show organizer (an Equine Canada Show) and I had lots of experienced help. I learned so much. Anyway, I'm afraid I made myself sound more experienced than I am. I used my past event management experience, read lots of resource material and we had a great team that pulled it all together. Jennifer and her friend Maria came to the barn after I rode Rogo, and Jen rode Dan again while Maria took pictures. Free jumping first, then riding. She did great with him again so I'm very happy about that. I'm lucky to have found a good rider like her to ride him and she feels happy about it too, so it's win / win. It's normal to get tired fast on a horse with big gaits. My Friesian had huge gaits - stunning to watch, fun to ride and utterly exhausting. Just think how strong your core is going to be! The fatigue could be because you're using big muscles instead of small ones to maintain position - if you can lightly engage your core sometimes that allows other muscles to relax. Takes some work on relaxation and body awareness for me. Thanks for the feedback. Ironically I was working on relaxing my core and hips on the longe and I was exhausted afterward :) Guess I still have a way to go! I appreciate the feedback from both of you. This is good to know. Carol - big horses - huge gaits - exhausting!!!! I know that one so well! From lessons on Karaat (almost 18 HH German Warmblood) to training Rosie ... tired! As for relaxing/loosening... Yoga is my best friend! The smiles of the rider on Dan is priceless! Tough workout! I am sore just reading about it! I like the photos with Dan and Jen - I saw your other post about them together but didn't get to comment - I am going back there now. Carole, what a good session you had! Rogo is such a wonderful horse! You guys are doing so well together. In past lessons I had, the instructor would work us to death and at the end, I was just exhausted, so yes, sometimes our lessons or riding is so very taxing. I agree with you also about lessons; I take weekly lessons (and monthly reining clinics) and love it. It keeps me growing and stretching and makes me a better rider. For some reason, I couldn't enter a comment on your most recent post, so... I agree with you about how lucky we feel to have a horse!! It is definitely worth all of the financial sacrifices we might have to make.